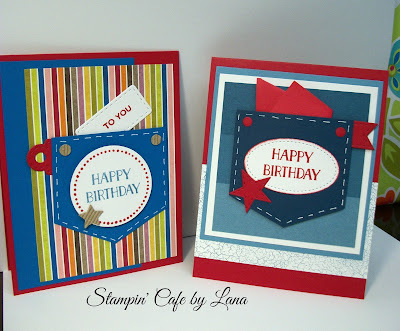 These pocket birthday cards were created using several Stampin' Up papers and cardstock. The pocket is hand cut and open at the top to insert a message, gift card, money, etc. Each card is 4-1/2 x 5-1/2 inches, top folding. To make the pocket, I cut a piece of blue cardstock to 2-3/4" wide by 2-5/8" tall. At the bottom of the cut piece of cardstock, find the middle. Using a ruler, measure up diagonally on each side approximately 1/2 inch, mark and cut off the corners. I used a white gel pen to make the faux stitching, and added some punched out colored circles for "rivets." 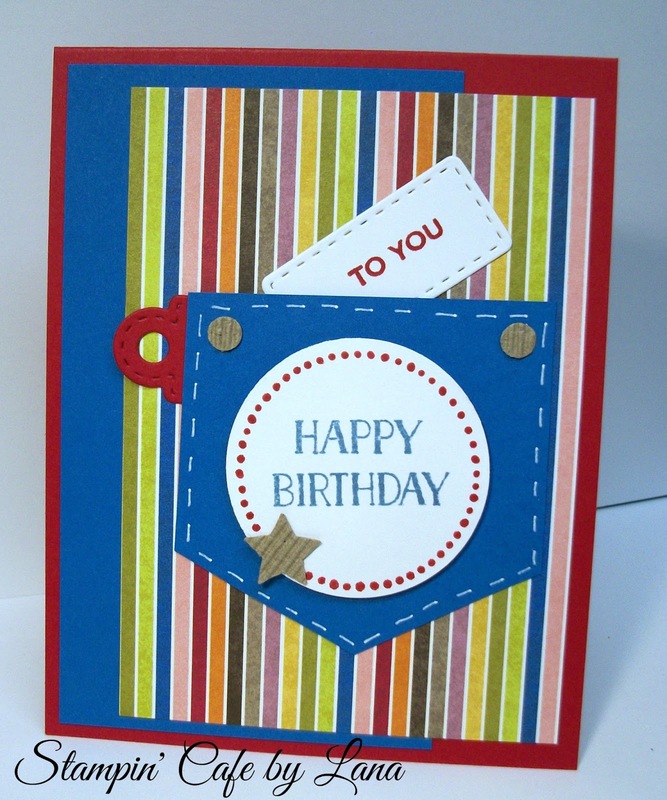 For the pocket tabs, I used the top of a die cut tag for the striped card and a small banner for the blue and red one. 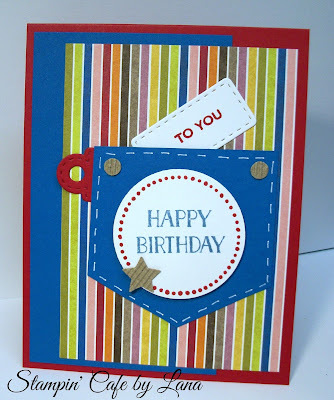 Attach the pockets to the card using a thin bead of glue or a thin strip of double sided tape to the two sides and along the bottom, leaving the top open. Stamp and punch/cut out your greetings as desired. 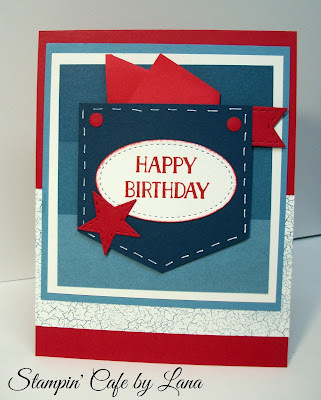 I added a die cut star to each card for embellishment. I also inserted a "To You" stitched tag inside the pocket on the striped card and a folded piece of lightweight red paper inside the blue and red card to look like a handkerchief. You could also insert a gift card or money! Stampin' Up Cardstock in Real Red for both cards. Stampin' Up Birthday Memories DSP for the first card, along with Pacific Point Cardstock for the pocket and partial front piece. Stampin' Up Color Theory DSP for the second card, along with Night of Navy cardstock for the pocket. Stampin' Up Tin of Cards stamp set for birthday greeting. Stampin' Up Perfect Pairings stamp set for the "To You." Stampin' Up Perfectly Wrapped stamp set for the dotted circle around the greeting on the striped card. Various die cuts and punches to cut out greetings, stars, banner for pocket, and tag top for pocket. I plan on giving these cards to several teenage boys for their birthdays!